Aside from Greg Bell's illustrations, what's fascinating to me is how many creatures appear in both the Neutrality column and either Law or Chaos. I'm particularly intrigued by some of those who can be either Neutral or Chaotic -- orcs, ogres, and minotaurs most notably. 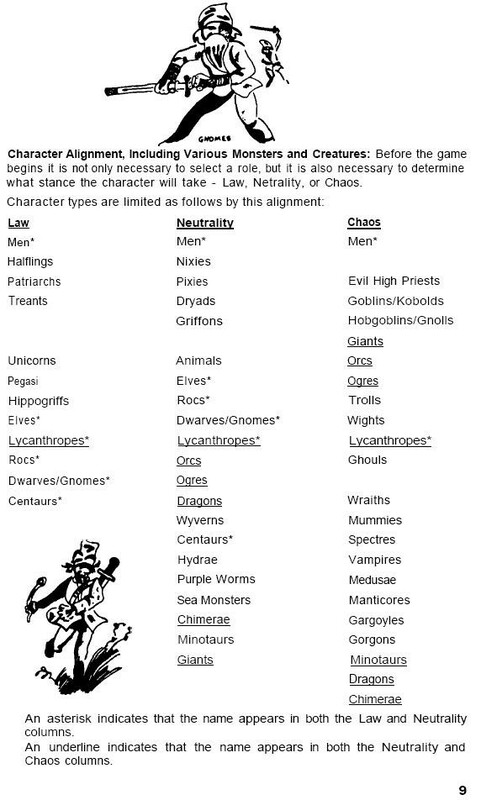 In itself, it's no big deal, except that the chart also lists goblins, kobolds, hobgoblins, and gnolls as irredeemably Chaotic with no exceptions. I can't help but wonder if there were a reason behind this or if it was simply done without any real thought, especially when you look at this later chart, which accompanied a Gary Gygax article from a 1976 issue of The Strategic Review. Here orcs, ogres, and minotaurs are all unambiguously on the side of Darkness. Admittedly, the situation is complicated somewhat by the introduction of the Good-Evil axis to the alignment model, but, even so, there are no Neutral humanoid beings whatsoever. As I said, this more than likely means nothing in any absolute sense. So much as D&D wasn't designed so much as happened. Even so, I find it worthwhile and often inspirational to take note of how various aspects of the game were presented at different stages of its existence. Being a Holmes baby, I have a certain fondness for the fivefold alignment scheme, even if it's not quite what I use in my home campaign. Likewise, the threefold system of OD&D is a little too simple for me, but that doesn't mean I can't find it a good source of ideas at times. So, in 1976 Gary thought liches were more lawful good than dwarves? Weird. I'm intrigued by the placements of the dragons; platinum dragons (plural) as CG, and blue dragons only slightly less chaotic than reds, but "chromatic dragons" listed as pinacles of LE. Again, it shows the gradual development of the now familiar dragon distribution. Druids, Zombies & Thieves would be a good name for a module ... or a band. How did they ever publish that OD&D page, even being publishers? Why asterisks and underlining and not simply a spaced structure with the entries using smaller-sized characters? There'd still be space for the art along an edge. Why those few blank lines that there are? Why the reordering of entries from column to column? To be honest, I don't think we're very much better at presentation today. And presumably we have less of an excuse, given the dog's dinners we've likely each seen down the years, and the experiences we've had using them. Re the categorising, I'm inclined to believe there was some degree of reasoning behind it, if not simply a sense of right fit based on personal understandings, but quite possibly less than we might expect with the amount of thinking about the game we've done since. It just depends on your style and preferences. Things that are too neat and clean, I feel, limit my creativity. If the whole things is laid out messily, it just looks RIGHT to mark it up with a pencil. To answer your question though. I know that several of those blank spaces are limitations of creatures that, since the original printing, have been deemed to be copy-right material, such as Ents and Balrogs. If I knew that, I didn't remember. It's interesting the entries below the spaces weren't bumped up, to hide the removals. Did they choose not to I wonder? It's interesting to think how much time and thought went into the reprinting, whether they mulled it over as a conservator might or just ran it off and passed it through. The need to remove any terms strikes me as laughable - in 2012 'ent' and 'balrog' arguably belong to us all. Why not simply a disclaimer, an acknowledgement of respect for the integrity of the original by printing whole? I understand it's seen to be out of the question, but is it necessarily so, or even in line with the purpose of the body of laws as a whole? As players we can each imagine an ent, and have it do anything we want it to do in our heads and in the worlds we jointly create, but we can't see its name written. It's as if one corporation nods to another, cleaves to their code of honour, whatever the constituent human beings might prefer. As an aside, could corporations be considered part-autonomous hive entities? Maybe they ought to be listed. But which column? Re the messiness, I'll certainly agree we can build on any lack of logic, or learn an illogic - or a new logic - from it. Maybe that's what happened with us here? Maybe the messiness of the beginning encouraged creativity not only through the missing rules and lack of elaboration, but even through the layouts. Could that then be encouraging us ever more as the years go by and things get more refined? Maybe a movement of later lateral development like the OSR is all but inevitable in any field, and the time period depends only on speed of general progress within that field. First list-To me it looks like either a Chainmail artifact (don't have my copy available) or something they used with Chainmail games. Basically an army list/available troops list. If your Warlord is Lawful he can only recruit troops from the Lawful list. If Chaotic from the Chaotic list. The idea being to avoid having Dwarves and Goblins in the same army, for example. I've always been intrigued by the movement of orcs on these scales. By the time the Monster Manual came out, they'd become Lawful Evil, not Chaotic. LE made more sense to me, because it put them into the camp of creatures that are well suited to fill the military ranks of evil overlords. I suspect that most of these changes have more to do with Gary's evolving views on alignment than on changes in thinking about the monsters. 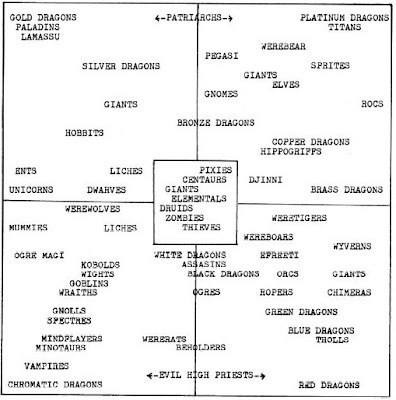 Alignment clearly meant something very different by the time AD&D rolled out than it had in the LBBs. Having just re-read "Three Hearts and Three Lions" makes these charts look particularly interesting to me. There is a scene in THTL featuring a Lycanthrope which shows the creature being affected by the incursion of actual Chaos into the world, where the person would otherwise be a perfectly "lawful" individual. It should be noted in the Poul Anderson equation, there is no "neutral" ground at all. One is either opposed to Chaos or a part of it. This can be due to the influence of regional Chaos affecting behavior, but even with people with complex personalities (Holger is no Saint after all) their "alignments" seem clear as the create manifestations. Also in the Anderson system, the actual forces of Chaos are evil. What becomes interesting is that there are magical creatures that can only exist due to Chaos, but who side against it. One imagines that the transition to an alignment axis allowed for a better representation of such creatures -- if an "Andersonian" intent was even there to begin with. I think Gygax concived Chaos like Bad Boys and Law like Good Boys in a first moment. Later he reelaborated his ideas and used a more philosophical and less theological explanation. That would be more Lawful Neutral than LG by my reading of the second chart. I think that the idea that liches can be relatively good is an interesting one. It doesn't match up with the later idea of them as evil masterminds of the undead. "As an aside, could corporations be considered autonomous hive entities at this point in history - are they lifeforms?" I have read in New Scientist that corporations exhibit a set of behavours that were they manifested in a person, they would be clearly psychopathic. And yet at the same time you've got passages in the AD&D DMG to observations like, "There is not much chance that the chaotic orcs will have sent for reinforcements" (p. 104), so truthfully that issue never really got settled. May the Dice Be With You!